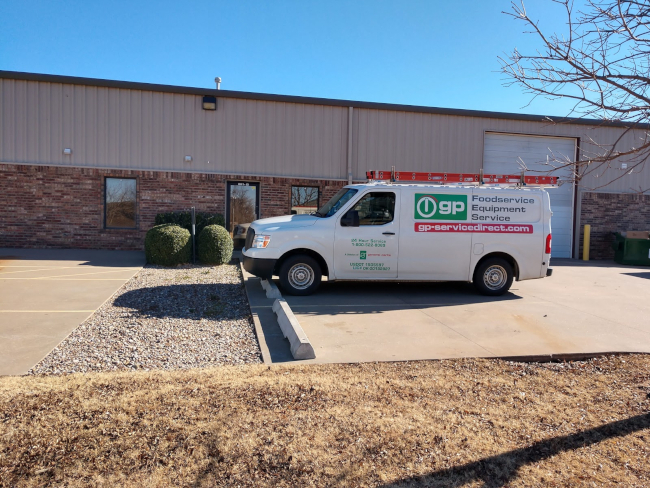 General Parts Group in Oklahoma City is located at 801 SE 84th Street, Suite B. We offer a wide array of food equipment service and repair for central and west Oklahoma. Your critical equipment needs are safe in our expert hands. Our factory-trained and industry-certified technicians can service all major equipment types and brands. We get more accomplished in one visit. Repair and maintenance services are available for commercial cooking, such as commercial oven repairs, food preparation, HVAC, refrigeration and ware-washing equipment. With our 90-day labor warranty and strong customer service, we know you will have as much confidence in our services as we do. For more information, please contact our OKC office (405) 528-8883 or email OKCityDispatch@GP-ServiceDirect.com. We know your business like you know your business. Year-round emergency service – We offer emergency commercial appliance repair service 24 hours a day, all year long; we are never more than a phone call away. Never worry about holiday or late-night malfunctions. Customized service plans – Your restaurant equipment repairs should always work to its original factory specifications. Our planned maintenance programs are individually designed with this in mind. Regular equipment maintenance reduces failures, extends life, and helps maintain your food quality and consistency. Flexible scheduling of repairs – Our commercial appliance repair technicians are factory trained and industry-certified to do the job quickly, cost effectively and right the first time. To minimize the disruption on your operation, we work around your schedule. Small appliance repair – Commercial kitchen appliance repair can be done in our Oklahoma City location’s onsite repair shop. Drop your item off at our shop and our certified technicians will service it there. Installation of equipment – Our certified technicians are also qualified to install most brands. Installations can be scheduled outside of your hours to minimize business disruption. We cross-train our technicians so they can accomplish more in one visit. Keeping you in the know – General Parts Group’s Automatic Status Update System keeps you up-to-date throughout your food equipment service. Should you have any questions during the process, our staff is always happy to discuss your concerns. Online information – Access to account information could not be easier than with our Client Portal. Access the portal via our website and find service history, open and closed service orders and more. Click here to request access. Quality parts – Our technicians only use manufacturer recommended parts, which we inventory at our locations. For those who can perform their own foodservice equipment repair, we’ve got you covered. Each part and more is available at our online parts store GP-PartsDirect.com. Ground shipping is free when you pick up your order at our location. Warranty – With our 90-day labor warranty and strong customer service, we know you will have as much confidence in our services as we do.